Unremarkable little Bob's Hill as seen from the east - a summit that launched a trek of 12,000+ miles (and counting). Ten years ago on this date, January 24, 2007, I gave up twenty five years of life as a couch potato. I went out and found a trail, and I hiked it. It was just a mile and a half up a hill and back, an effort that seems woefully insignificant in retrospect. But the point is that I did it. I had decided to get myself into shape, and this was the first step. The 'getting into shape' actually started back in August, 2006 when I decided I was sick of feeling puffed up and bloated. I went on a severe calorie-restricted diet and dropped 33 pounds in 100 days. I did not consult a doctor and I did not do one whit of exercise. I couldn't recommend that approach to anybody else, but it worked for me. The next step in the transformation from couch potato to long distance hiker came in December, when I watched a Discovery Channel series about an expedition to Mt. Everest led by Russell Brice. It was a six-episode series and the installments became the highlight of my week. One of the participants was 62 and had just had surgery to remove a cancerous kidney. I was 58 and generally in good health, if out of shape, so I reasoned that if he could get out and tackle something that tough, so could I. In the back of my mind was a 'Bucket List' goal that I had set for myself back in high school. It had lain dormant all that time but not forgotten. Before I died I wanted to climb a 20,000 foot mountain in South America. After the TV series ended I sent an email to Russell Brice, and he promptly and personally replied. From that moment on I knew I was going to give it my best shot. As I dreamt of Everest I began researching Russell's expeditions and I studied brochures of companies offering climbing excursions in South America. I spent a month gathering information and building up inspiration and excitement, all from the comfort of that soft, cushiony couch. A full month. Well, when I finally did manage to stir that body into motion, a few of the wheels and gears naturally complained. My personal journal entry from that fateful day seems almost comical, particularly the part highlighted in bold type. Here is an extended excerpt. WEDNESDAY 24 JANUARY 2007: I fell asleep instantly and slept like a log until 5AM sharp. 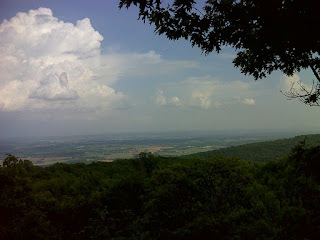 At that time I got up because I wanted to look at maps of the Catoctin Mtn. Park/Cunningham Falls Park area west of Thurmont, MD. Early yesterday morning I had hatched the idea of using that as a nearby training ground for mountain hiking. I am hoping to find a good place to hike uphill carrying weight and then down without it, either using the hand truck, or using water jugs that will fill and empty easily. I couldn’t identify a good stretch of trail I could hike near road access, such that I could possibly ride a bike or trundle the hand truck down asphalt and hike up a steeper foot trail. 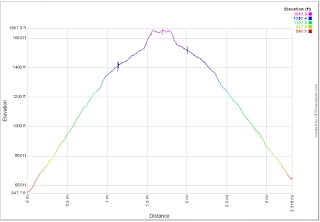 But the Bob’s Hill trail from the Manor Area parking lot of Cunningham Falls park, right off highway 15, provides an excellent rise of 1100 feet in less than a mile and a half. So I was really eager to check out that trail – so much so that it was hard to resist jumping in the car immediately and going there, and so much so that I was willing to give up my book writing time. That’s the way it is when I get a “hot” idea, and I guess that it’s a healthy sign that I can get do excited about something that I happily break my entrenched routine – probably helps keep me young at heart. Anyhow, instead of leaping into my car, I got up out of bed where I was looking at the various maps and trail guides (the Bob’s Hill trail is part of the Catoctin Trail that is documented in the Appalachian Trail guide book and maps that I have for Maryland). I did some usual chores and spent some time on the book. But yes, I was too excited to go see the Bob’s Hill trail. So I got off the computer at 9:10 and dressed and packed up and left for Thurmont at 9:20, arriving at the parking lot at the trail head at 10AM sharp. 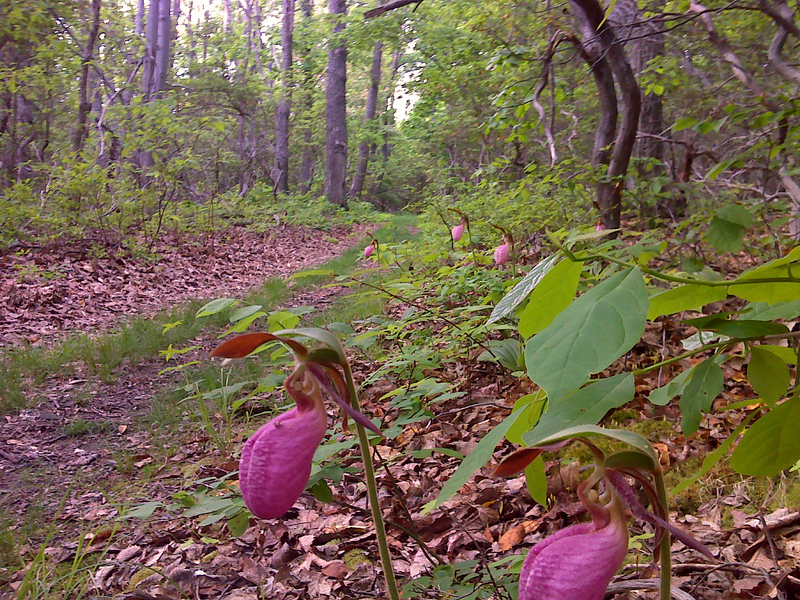 I headed up the trail to the top of Bob’s Hill – an 1100 foot climb in 1.5 miles. The uphill trek was nowhere near as difficult as I had expected and hoped. The slope was only really taxing in one short stretch right before the top where there is a side trail to the overlook. The view from the overlook was nice – a pretty picturesque rock outcrop was great for having someone stand on as a photo op with the scenery in the background. It was the downhill part that was hard. I was using my ski poles religiously and taking my time. As a result, my left knee never had a twinge, but there were a few twinges in my right knee and more surprisingly, almost every other joint in my body started complaining! My hip joints seem to have had the most enduring complaints – I think I was walking stiff legged enough that the hips were doing a lot of the work that the knees might normally have done. Also, my arms complained. Even my hands got pretty exhausted from holding the ski poles and using so much arm power to help support the weight on descent. But almost all the complaints went away instantly when I sat down in the car. The climb to the top took 40 minutes and it took me the same amount of time to descend in full knee preservation mode. Bottom line: I feel as though I passed this test – 1100 feet climbed without added weight and descended with only minor temporary joint problems. Next step will be to repeat the climb with the 5 gallons of water on my back. But before I do that I need to get a good sturdy container or containers for the water, so I can easily empty it at the top, and so I don’t have to worry about babying the containers. It’s clear that because I rely on the walking sticks so much, I don’t want to use the hand truck on the way down – even though the trail is probably smooth enough to allow me to use it. I was back down at my car at 11:35. That is definitely the closest mountain trail to my apartment, so it’s a real serendipity that it is also one with a good vertical ascent in a fairly short distance. I drove back home, arriving at 12:15. I didn’t even notice any difference from normal as I climbed the steps to the apartment! I started warming up lunch, looked over the maps and trail info as sort of a post-mortem then took a shower before eating lunch. At 1:30 I lay down and napped – mostly rested my body. But the body didn’t really feel as much need for rest as I had thought. It took almost a week before I went back. 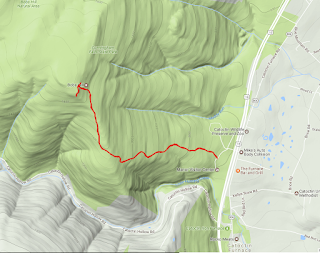 After that climb I stopped at the Trail House in nearby Frederick where I spent a couple hours with an experienced hiker/climber named Jeremy, and I bought my first gear, including my first pair of Crocs. Since then I've climbed Bob's Hill more than 115 times by my best count. It's a nice climb with that great view as a reward at the top. 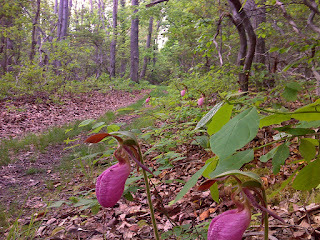 And in May, along the middle part of the climb, you're sure to see loads of the wild pink orchids called 'Lady Slippers' right beside the trail. 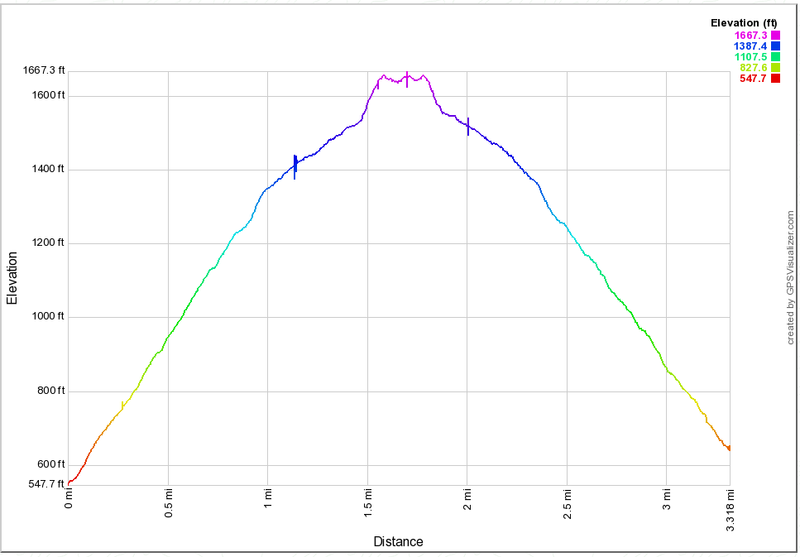 Back in May 2015 I took a nostalgic trip back there with my GPS and recorded the track and the elevation profile. What happened next? Well, in March I took a mountaineering training course in the White Mountains of New Hampshire. The climax of that trip was a winter climb to the summit of Mount Washington. I did Bob's hill about thirty times with ten pound weights on my ankles and fifty pounds of water on my back before heading to South America in late May. I had hoped to join a later excursion, set for July, when I'd be in better shape, but nobody else was signing up for that one. I was so eager to go that I gave it a shot. But I wasn't in good enough shape to get to 20,000 feet. I made it to over 19,000 feet but a combination of lack of training time and 'Montezuma's Revenge' kept me from my goal. After at least fifty more ascents of Bob's Hill carrying 50 pounds of water, and months of grueling interval training (a method that simulates the oxygen deficit of high altitude) on a tread mill set at maximum incline with the same burden on my back, I finally achieved my Bucket List goal in Argentina in early 2010 (see this series of blog posts with the label 'South America'). Since then I've hiked the Appalachian Trail twice in a calendar year (they call it a yo-yo), and many other long distance trails. "Step out. Discover your path." Love this. Hearty congratulations for all that you have accomplished thus far! Via this interesting blog https://nerdymates.com/blog/rhetorical-essay you gonna get top articles on various essay writing-related topics.